Incredible Nimbinis juggle on a cloud with the greatest of ease. 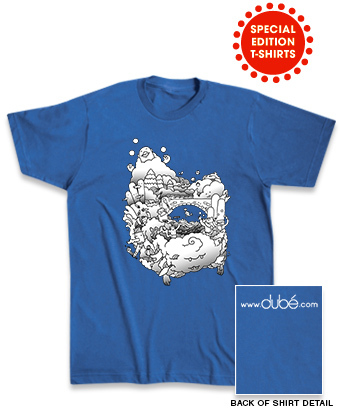 Presenting a Special Edition Juggling T-shirt for the young and old, ladies and gents - designed by Eric Terry of Linty Fresh, and commissioned exclusively for Dubé Juggling. All shirts are 100% cotton. **Unisex sizes: Men's sizes should be true; for women's go one size down. #2115 Incredible Floating Nimbinis T-Shirt $20.00 ea. Colors: Red, Purple, Blue, Aqua, Olive, Gray, Black.